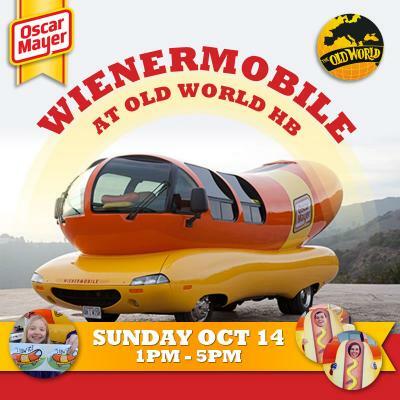 HUNTINGTON BEACH, CA (October 10, 2018) – The World Famous Oscar Mayer Wienermobile will be making a rare appearance at Old World German Village this Sunday, October 14 from 1:00 pm to 5:00 pm. Guests will have the opportunity to take photos with the giant hot dog, play games, win Wienerwhistles and coupons. The Wienermobile is a 27-foot automobile shaped like a bun and hot dog. The first version was created in 1936 and variants are still used by the Oscar Mayer company today. Drivers of the Wienermobiles are known as Hotdoggers and often hand out toy whistles shaped as replicas of the Wienermobile, known as Wienerwhistles. Sunday is Kinderfest celebrations as part of Orange County’s Original Oktoberfest. Open to all ages (anyone under 21 must be accompanied by parent) from 2:00 pm to 7:30 pm. Admission for Adults is $10, kids 6-12 are $3 and 5 and under are FREE. This year’s Oktoberfest will run Wednesdays through Sundays through October 28. Wednesdays and Thursdays are FREE and open to all ages (anyone under 21 must be accompanied by parent) from 6:30pm-10:30pm. Fridays and Saturdays are open to anyone 21 and over with valid identification from 6:30 pm to 1:00 am. Admission is $10 on Fridays and Saturdays ($15 for Saturdays in October).